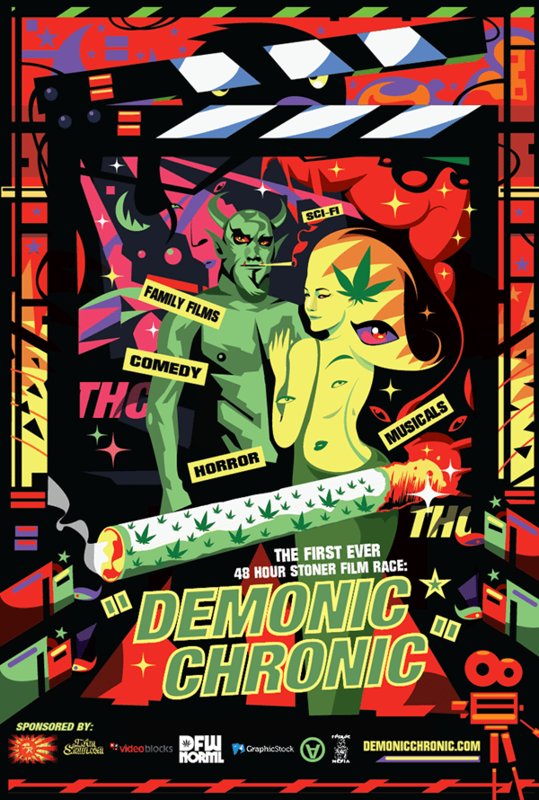 The Demonic Chronic 48 Hour Stoner Film Race is the first of it’s kind. This event blends two of the best things on earth, movies and weed. – Creativity and the use of Storytelling. – Creative use of Genre and Elements. – Adherence to Competition Rules. AWARDS – There will be awards given to 1st, 2nd and 3rd place as well as Best Use of Weed and Best Product Placement. PRICING – Register your team for $50 during our early bird registration until March 31st because after that, it jumps up to $75 per team! Email shaun@dfwnorml.org for information on sponsoring this unique event. Q – How many people can be on my film team? A – As many as you want. Q – What is DFW NORML’s involvement with this event? A – DFW NORML was our first event sponsor. They’ve provided creative, promotional and financial support for this event and will also have their own team submitting an entry to this race. Q – How is this film race different? A – This is the first 48 hour film race targeted specifically to filmmakers who are fans of the herb. Participants will be making “stoner films” that must fit the genre they draw during the Kick Off Party on 4/18. The film must also contain a specific line of dialogue and a few other things that will be announced as the date gets closer.